The first thing that strikes most the ear when we discover this last album of Divine Matrix is this disconcerting facilitated that has Steve Barnes to create structures of intrusive melodies. “Hydrosphere” is an oceanographic musical tale with a strong oceanscape environment where thrones a multitude of melodies weaved through some fine minimalist movements. The piano is charming and attaches its airs, as well melancholic as romantic, within delicate lines of rhythm before getting melt into the ethereal atmospheres which guide our cortex in a sonic adventure where we have the impression to be on water, to be a member of a crew which sets out to conquer mysteries and beauties of a world of water. 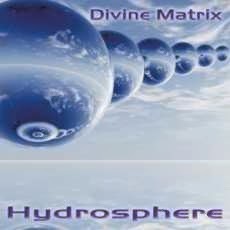 Divine Matrix exploits all the big themes, the legends and the realities, of an aquatic world while our ears, well wrapped up in a set of headphones, guide us towards the borders of black, with divine harmonies which float, roam in dense musical paintings as much rhythmic as ambiospherical. “Hydrosphere” becomes then a fascinating sonic journey between the myth and the reality, between the rhythms and its ethereal atmospheres. It's in the reflections of the soft lappings of water that "Ocean Bound" is connecting with our ears. The rhythm is soft. It leans on a delicate pattern of pulsations which drain themselves hastily by minimalist lines while the melody is forged through the delicacy of a dreamy piano. Melody and rhythm make a tandem which swirls with more velocity, a little as if we would be sucked up by the bottom. The sequences sparkle with a harmonious neatness whereas percussions appropriate the sharpness of a rhythm which swirls in submarine waves, leading the finale towards a kind of ballad entailed by the riffs of an acoustic guitar. The evolution, intensity and diversity start pretty well this last album of Divine Matrix. But the vocals on "A Different Sea" are not really my cup of tea. An ethereal voice floats over a rhythm which flows in a curt, jerked pace. It sounds like nice ethereal synth-pop à la Enigma with its structure of vaporously stroboscopic rhythm where the piano eats away at our eardrums with crystal clear and very glittering notes. The narrative introduction of "Dolphins" presents an ambient structure with tears of synth which float in chirpings a bit rubbery while the rhythm embraces a static spheroidal structure which rolls such as a lascivious dance of dolphins in a cylinder form basin. "Submarine" is another ambient melody which sings on an absent rhythm. The arpeggios let float their wandering harmonies on a discreet rhythm of which the harmonious envelope takes control of the brain with its delicate stroboscopic membrane. "Bermuda Triangle" is a long ambiospherical piece of music where the sonic elements surround us with mystery and tenderness, in particular with synth lines which sing and float like lost souls. We feel a fine line of rhythm which drums its pulsations in a dense cloud of spectral tones. A rhythm which evolves with discretion before dying out in front of all these caresses and these floating harmonious lamentations which maintain the structures of "Bermuda Triangle" in its mystic envelope. "Drifting on the Tide" carries superbly its title. It's a very beautiful ambient track and we really have this sensation to roll peacefully on waves, as oceanic as cosmic. "Over the Reef" is a fine ambient melody which rolls its harmonies in loops on another finely stroboscopic structure. The rhythm circulates like a long spiraled cylinder which gradually amplifies its emotive approach with a gradation in its schema which espouses the same pace as the harmonies which are simply catchy. "The Diving Bell" is another delicate ethereal melody with a beautiful line of piano which widens its melodic empire through a dense sound pattern where the cosmos embraces the oceans. More quiet and more ambient, "Deep Blue" entails us in the depth of our imagination with a beautiful melody which flows like a mass of drops of an azure. The title-track knocks down downright the soft morphic atmospheres of “Hydrosphere” with a nervous rhythm where the neurotic sequences remind the rhythmic shimmerings of Tangerine Dream. The rhythm is pulsatory and the sequences draw filets of melodies which catch the hearing as the same time as the tempo makes us stamp. And quietly, the rhythm is dividing up in order to spit some furious keys at a structure which tilts for a strong unbridled up-tempo with great sequences which clink on sonic waves to the melodic outlines. I have the vague impression to hear Geoff Downes, vocoder less, and his New Dance Orchestra. "Plankton" ends “Hydrosphere” with a cloud of synth lines of which the narrow weaving rolls its harmonies in loops. The rhythm takes shape by furtive movements, drawing these strange swirled plans that make the planktons to protect themselves from predators. The harmonies get loose from these oscillatory lines. They drop their airs lost in sea bed while synth solos sing in the same spheroidal current of the planktons, witnesses of another beautiful album from Divine Matrix where Steve Barnes handles marvellously his soft dreamy poetry on rhythms as ethereal as musical.